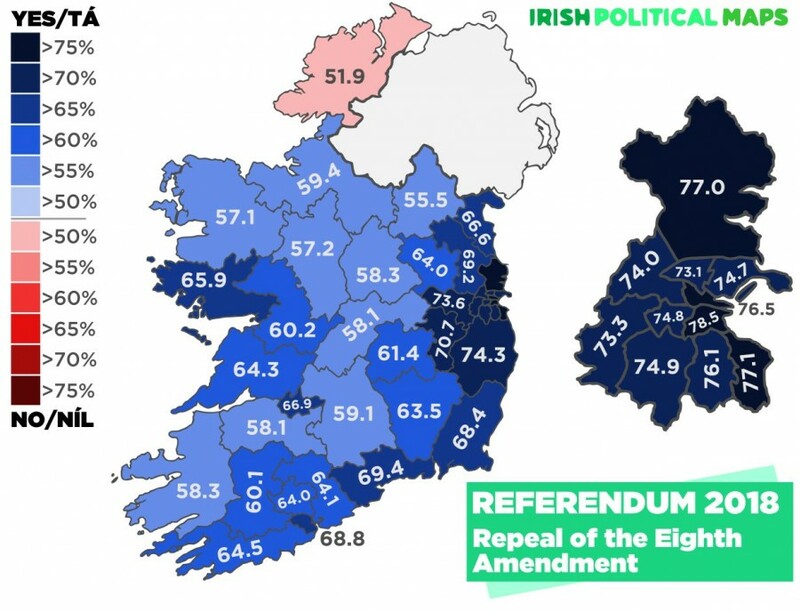 Although there was a narrow majority against the repeal of the Eighth Amendment in the Donegal constituency, the more liberal votes in the southern tip of the county, which is electorally attached to Sligo and Leitrim, are sufficient for us to state that every one of the classic Twenty-Six Counties voted in favour of repeal. 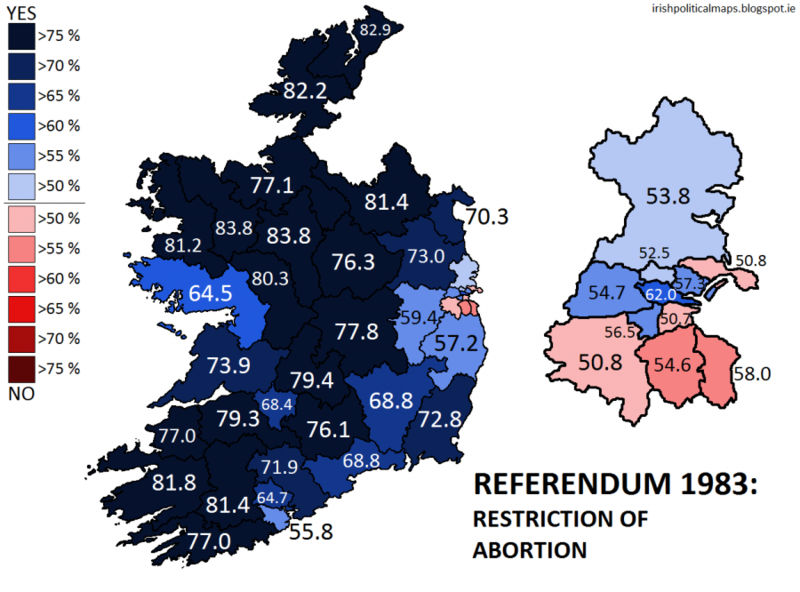 It's interesting to contrast with the vote in favour of the Eighth Amendment back in 1983 (on somewhat different electoral boundaries). It's perhaps worth noting that the spread of results was greater in 1983 - almost 42% separated Mayo East and Roscommon, on the one side, from Dun Laoghaire on the other; this year the spread was just over 30% between Donegal and Dublin Bay South. It was a divisive campaign, but the settled will of the people is now clear. I'm not going to write about the substance because I've already done that, and the debate is over for now. (Though Northern Ireland still remains to be addressed.) A few notes however. Some foolish commentators have been suggesting that liberals only like referenda when they give the right result. Well, I have to say that it sits very uncomfortably with me that anyone votes to decide on whether or not their fellow-citizens get to enjoy what should be inalienable rights. But we live in an imperfect world, and the Irish Constitution is what it is, and I'll take my moments of joy where I can find them. At the same time this couldn't have happened without hard work from many people over many years. I particularly salute Aileen O'Carroll, who successfully chipped away my certainty in my own long-ago pro-life days, and who has been campaigning to repeal the Eighth Amendment since at least 1988. There are many others like her; but I have known her for the longest. I also salute those who shared their own stories during the campaign. That, I think, was crucial in swaying many voters who may have thought that this was a theoretical and even theological issue with which they had no direct personal connection; and then discovered that they were wrong. Of course, the work of ensuring that the needed and promised legislation now gets passed must continue. But for once, the hard work doesn't start here; it has been done by the 1,429,981 people who voted to repeal the Eighth Amendment on Friday. Margaret Mead famously said, “Never doubt that a small group of thoughtful, committed citizens can change the world; indeed, it’s the only thing that ever has.” One again she has been proved right.